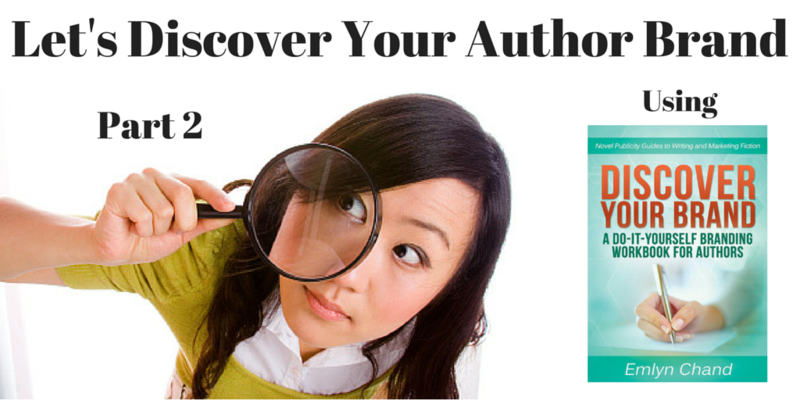 This is Part 2 of “Let’s Discover Your Author Brand” using Emlyn Chand’s and Robb Grindstaff’s book Discover Your Brand: A Do-it-Yourself Branding Workbook for Authors. I’ll refer to the book from now on as “Discover Your Brand”. For those interested, Part 1 is here. Last time I talked about defining the concept of “branding” and some problems you may run into when you try to figure out your own author brand. In this post I delve into Discover Your Brand itself, begin the work to define my brand. Today I’ll cover the introduction, chapter 1 and chapter 2. This is pretty standard for a “how to” book in the indie publishing world. The authors lay out their reasons for writing the book, along with an informal definition of branding. They touch on the difference between your personal identity and your author identity to help clarify the concept of branding. Also included is the experience of one of the authors (it’s not clear which one) in writing and publishing without considering their brand. You may be tempted to skip the introduction. Don’t. It’s written in a light, breezy style, provides some nuggets of information, and sets the tone for the rest of the book. Chapter 1 is very short, just a page and half long. It’s main purpose to inventory the items you will need in order to complete the brand discovery exercises in the rest of book. Required materials are minimal, consisting of index cards, something with which to write, a computer, and a notebook. The authors also state the importance of the approaching the brand discovery exercise without any expectations. I’m not sure that “expectations” is the best word, after all you expect to discover your brand with this book. In my opinion “preconceptions” is a better word. I didn’t use index cards for my work-through. As I’ll show you in later posts, I did everything in a Word table. The authors go into a fair amount detail about the selection process and the number of each type of idea. For each idea you are to write a very brief summary. Lady Merreth – a dark, leather-clad noblewoman flees from a crime she’s accused of committing. She winds up in the far west of the Matriarchy where she must survive a war, clear her name, and avoid those who want her dead. Reluctant Emperor – an ordinary man on Earth unknowingly harbours the dormant intellect, personality, and memories of despotic heir to a galactic empire. A rag-tag group of resistance fighters against the empire show up. They’re intent on abducting him and re-awakening the galactic heir and holding him hostage, which will wipe the protagonist’s personality and memory completely. The Spider Nurse – a crashed alien spaceship has one survivor – a medic in the form of large wolf spider with a brassy personality. Discovered by the US, she is the only source of information on an upcoming invasion of Earth. Not the best working title, I agree. Raptor Recon – while on patrol in the Middle East a Marine Recon platoon encounters a dimensional rift, through which is delivered an alternate Marine Recon unit from a world of magic. This unit is female staffed because only women can control the raptors that make up both the vehicles and weapons of the unit; both marine units must unite to defeat a greater threat that also emerges through the rift. Best Served Cold by Joe Abercrombie – this is a powerful, gritty story of revenge in a fantasy world. The protagonist is a female mercenary betrayed, beaten, and left for dead. Her assailants should have made sure. Lush descriptions, well-rounded, realistic characters, snappy dialogue and great plotting all make me wish I had written this. Pitch Black — this is Vin Diesel’s breakout movie depicting the crash of star ship on a desert planet and the subsequent survivors’ struggle against creatures that inhabit the weeks-long night. For me the most interesting character is Caroline, the star ship’s captain. Her character arc takes her from being willing to sacrifice her passengers in order to survive to fighting to have all of them live, even the worst of them — Riddick. Great plotting and character development make me wish I had written this story. The Quick and the Dead – a 90’s western movie featuring Sharon Stone as a female gunfighter with a past motivating her to participate in a deadly shoot out contest run by Gene Hackman’s character. “The Lady” goes from being somewhat uncertain to filled with deadly resolve by the end of the film. Nice action scenes and a good character arc make me wish I had written this story. The ideas you generate will form the raw material from which you will discover your brand. I recommend taking your time and thinking about the ideas, both brainstormed and borrowed. I took a week or two to come up with my ideas, and in writing this blog post I uncovered a commonality I hadn’t seen before. In chapter 3 the authors show how to use the generated ideas to uncover patterns.